The designs incorporated the traditional toasts: Happiness, Love, Health, Prosperity and Peace. Make this stunning stemware a cherished gift. A pair of exceptional lead crystal hand cut champagne flutes by Waterford. 2 Waterford Crystal Millenium Toasting Flutes "Love"
Up for sale are two Waterford Crystal Flutes. They stand approx. 9 1/4" tall. These flutes are in excellent condition. See photos to help judge the condition. Ve ry g oo dcondition. In originalb ox. DETAILS: W ha t a beautiful pair of Waterford crystal flutes to add to your collections! PICTURES DO NOT GIVE JUSTICE! 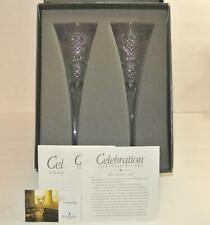 This is a lovely boxed set of two (2) Celebration toasting flutes. These are first edition - love, decorated with adorable hearts. Signed Waterford. In EXCELLENT condition. A Waterford Millennium "Peace" champagne flute. Celebration First Edition Love Two Toasting. WATERFORD Crystal Celebration Toasting Flutes. Never used. Wedding Crystal Toasting Flutes(2) Marquis Waterford Yours Truly w/Box Amazing! Great Quality perfect for Wedding! Exceptionally tall, the graceful trumpet-shaped flutes each exhibit a starburst cut design. Waterford, of course, is made with full lead crystal. Waterford Crystal Millennium "Health" Toasting Flutes Glass 9 1/4"
2 Waterford Millennium Toasting Flutes/Glasses - 5 Universal Wishes: CHEERS! For sale, this beautiful pair of Waterford toasting flutes found at a Washington DC estate. Celebrate the 5 universal toasts: Happiness, Love, Health, Prosperity, Peace. Sold as found. Excellent pre-cherished condition. One of them has a small flaw or chip on the top rim (see pics) the other does not. Both are marked Waterford on the bottom. They are overall in very good condition. Lot Of 2 WATERFORD Crystal (HAPPINESS & LOVE). The Millennium Collection. First Toast - HAPPINESS. (USA ONLY). Second Toast - LOVE. We have 3 physical locations in the Chicagoland Area. A Toast To The Year 2000. WATERFORD CRYSTAL The Millennium Collection 2000 “Health” Toasting Flutes w/Box. No chips or cracks. Marked and each has a sticker on it. Shipped with USPS Priority Mail. Waterford Crystal Lismore Set of 2 Amethyst Champagne Toasting Flutes 9 3/8"
Set of 2 Champagne Flutes. Waterford Crystal. No signs of wear. They are etched with "Waterford" on the base and still have the sticker attached. Original box is NOT included. WATERFORD CRYSTAL HOSPITALITY FLUTED CHAMPAGNE - 2 TOASTING FLUTES. Used but in nice shape. Waterford Crystal Millennium "Health"Champagne Toasting Flute 9 1/4"